In 2017, Indian metal act Hostilian hit the ground running with their first EP, Monolith. The band’s knack for piling together some thick grooves and tasty riffs made the debut an enjoyable one, and now we see it’s follow-up also in EP form. Catalyst keeps the heavy groove coming in regularly, just as the debut before it. 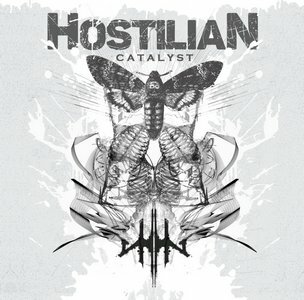 A modern feel with an emphasis on groove isn’t anything new at this point, but it’s in the way that Hostilian keeps things at a digestible serving and offers up some slick guitarwork that make things interesting. With four tracks, the straight-ahead approach works and never has time to become tedious. Especially since Hostilian never relents in tossing some real bone-snapping riffs towards the listener. Some of the strongest occur in “Inertia,” with its effective change-ups from thrashier tempos and transitioning into weighty mid-tempo groove-fests that really stick in your head, both immediately and after the EP is long over. While the ever-forward throttling is where the band spends much of their time (and rightfully so), there’s also room for expansion, as the opening and closing numbers offer some opportunities for more atmosphere within the pummeling. While it never goes too far outside the box, there’s some promise in their progressive side in addition to the grooving. A sleek 23-minutes is perhaps just the right size for a release like Catalyst. Some of the riffing structures will make you think a bit, while the grooves give it plenty of immediacy to pull you in. Hostilian are making some good progress with this second EP, it’s just a matter of time before more folks start noticing.